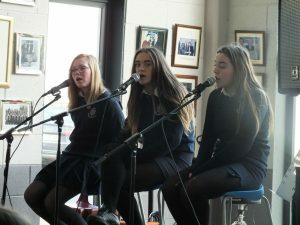 Sligo Grammar School boasts an array of musical opportunities at both Junior and Leaving Certificate level, with around 100 students at present studying music for the State Exams, which focuses on the three main areas of listening, composing and performing. 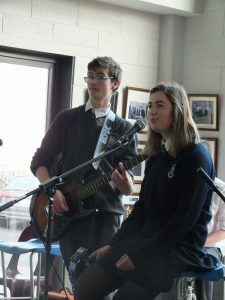 TY students can choose to take a class in musical performance where students perform with a chosen instrument. Music Technology has also been introduced in recent years. 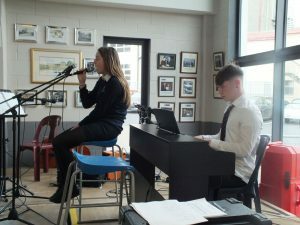 In addition the school offers private lessons in Voice, Piano, Guitar, Violin, and Saxophone throughout and after the school day. No previous musical experience is necessary. 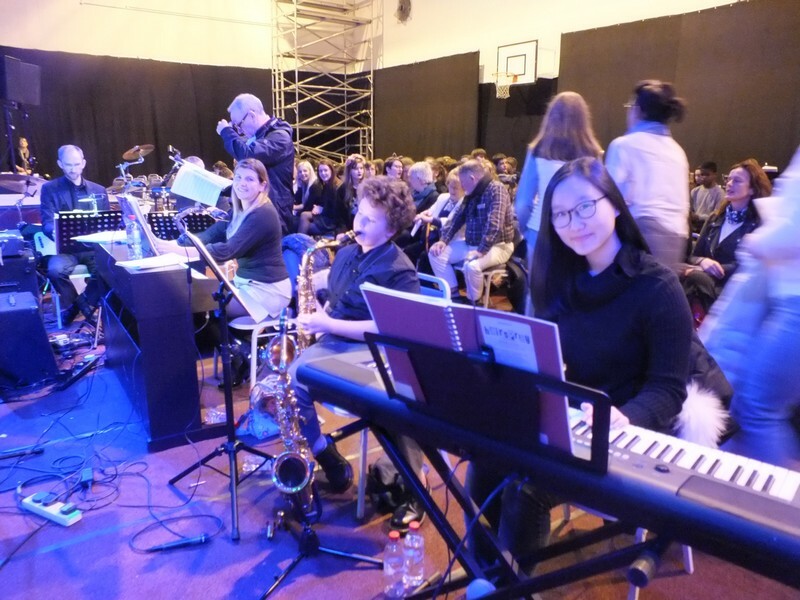 Students perform with teachers in the orchestra for the school musical Hairspray! 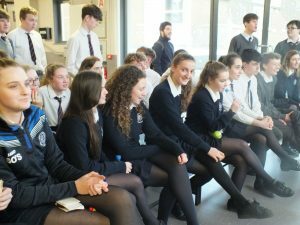 Outside the classroom , there are many different performance opportunities. 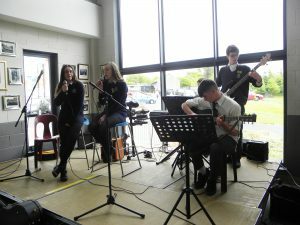 Each year one or two concerts take place in which students and teachers perform for both peers and parents. 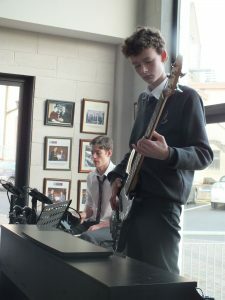 Lunchtime gigs have also become a feature of the school year, and , of course the more accomplished musicians in the school form the orchestra for our school musicals. 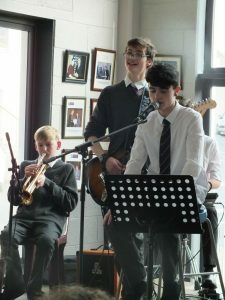 The annual Prize Giving and Carol Service also allows instrumentalists to perform alongside the school choir. 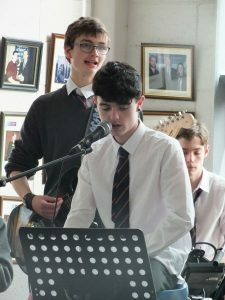 This term saw two lunchtime concerts and one evening concert. 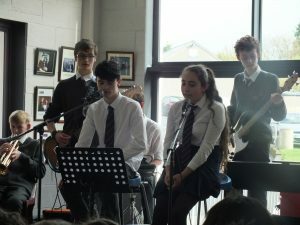 The lunchtime concerts give students an opportunity to perform in a friendly atmosphere while developing their performance skills. 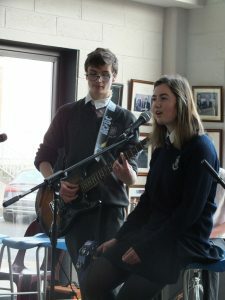 For the first concert performers were drawn from TY, and a Christmas concert featured students from across the school. 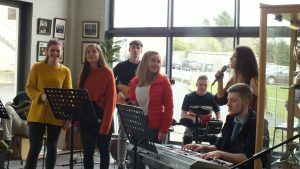 2nd year CSPE students organised and ran a concert in aid of NCBI in December. 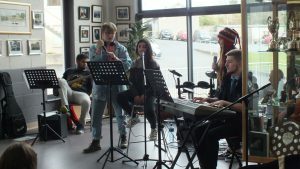 Students and teachers performed. This was their CSPE Action Project and forms part of their Junior Cert exam. 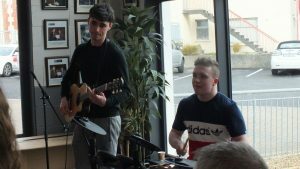 They collected over €1000 for the charity. 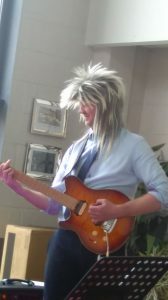 Below is a video of two of our teachers, Ms Tansey and Mr Mitchell with Mr O’Donnell on guitar and Mr Lynch on drums, singing “Blue Christmas” at the Lunchtime concert, Christmas 2016. Concerts and gigs are held a couple of times a year. 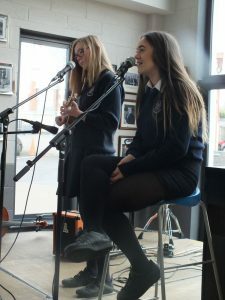 Informal gigs are held at lunchtime a few times in the year and there is often a more formal concert in the hall towards the end of the year. Parents and friends are always welcome to attend the performances. 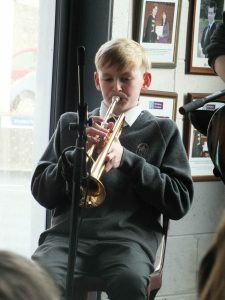 These give pupils a chance to gain experience performing and are good fun for all. 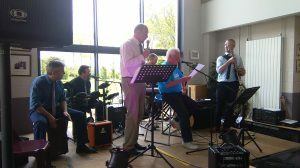 Below are photos from the last concerts of 2016/17 featuring Mr Doherty who retired in May 2017 and was a regular performer at the school concerts.